Can I just start by saying how much I love Finland? It honestly wasn’t somewhere that I was dying to go to before since I am not the biggest fan of cold weather. But after spending a total of 5 days in the northern region of Lapland, I fell in complete love with the country. Now I absolutely crave a winter wonderland vacation at least once a year. Finland is incredible! Thanks Finland, I’m hooked for life! 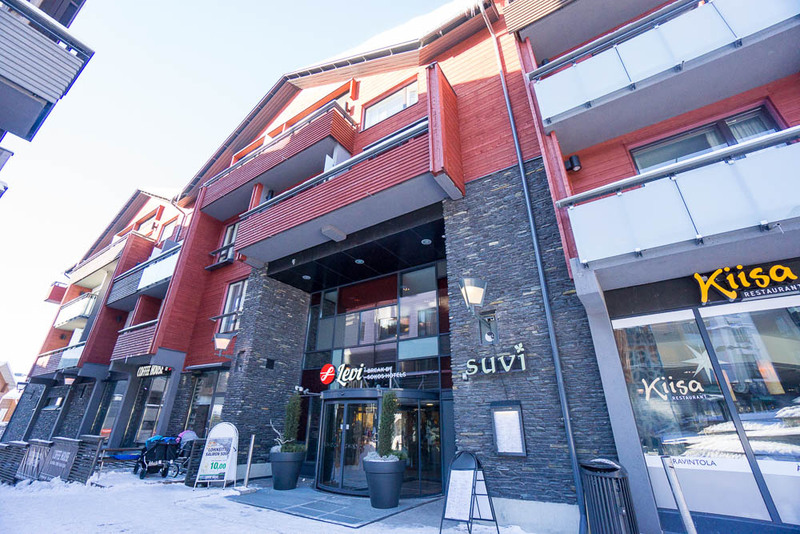 Located in the absolute center of the sleepy ski village of Levi, Break Sokos Hotel Levi is for those wanting quality accommodation at a reasonable price. Set across 3 buildings, Break Sokos has more of a homey boutique feel than a large chain hotel. A cute little log cabin behind the hotel. I wonder who lives here? The hotel is stylish, spacious, and cozy, and totally walkable to anywhere you needed to go in the city. PS. Levi is such an adorable little ski town. My favorite parts of the hotel were the onsite coffee house and the in-room sauna. Have you stayed in a hotel with a sauna in your bedroom? It’s. So. Freakin. Cool. My room was located on the 3rd floor with a view directly facing the ski slopes. The room was large for European standards with a distinct feature of a SAUNA in the bathroom. Yes, you have your own sauna! I can’t tell you how nice it was to get back from a day in the frigid Lapland air and relax my tense muscles in the soothing sauna. The room also had a heater, which I didn’t need because it was warm inside. Actually a bit too warm at night (I found myself sweating even with a fan I travel with (yes, I’m crazy). When I saw black out curtains I was super thrilled because light wakes me up instantly. But then I noticed there is a gap in the right side where light seeps through so it wasn’t totally dark. Breakfast was served from 7-10:30am and I appreciated the later service. I hate when breakfasts end at 9am, I’m so not an early morning person. The variety was large and included the typical hotel breakfast of cured meats and cheeses, bacon, eggs, bread and butter, cereal, yogurt, granola, and a do-it-yourself waffle maker. All allergens were listed in the dishes which was great. They even had a gluten free section, which I highly appreciated. Overall, the food was good, but not great (which seems to be the case in a lot of hotel buffet breakfasts). The variety was a plus, and trumped other hotels in that aspect. The only thing I was disappointed with was the service. There was one attendant clearing dishes and it was really busy in the morning. I sat at a table with a whole bunch of dirty dishes and in 40 minutes of me sitting there, they weren’t cleared. Not a huge deal, but eating breakfast with dirty dishes all around you is not what I expected. Like I mentioned above, the hotel was smack right in the center of the city of Levi with easy and quick access to everything you could need. Within a 5 minute walk, you could get to the gondola ski lift , a big market, several restaurants and shops, the tourist office, and the bus stop. You do not need a car when visiting Levi. I’m always hesitant to stay right in the center because it’s usually noisy and I’m the world’s lightest sleeper (seriously, I am), but this was probably the most quiet hotel I’ve ever stayed in. Noise is not a problem at all. Maybe the snow absorbs the sounds? I’m not sure but I’m going with it since I didn’t hear a peep from outside. Levi is a great city to explore the many unique activities Lapland, Finland has to offer. If you like skiing, this town is perfect for you! In less than a 3 minute walk from the hotel, you are at the ski slopes! Super convenient if you want to come back to rest or heat up between ski sessions. Amongst my favorite activities in Levi were a sauna + ice dip in a frozen lake (crazy fun) and a husky safari! Oh, and Finnish Lapland is one of the best places to view the northern lights. In fact, I happen to see them in the city of Levi on my way to a restaurant. I had my tripod so ran behind the building to snap a couple shots. I never thought I would see the northern lights in the middle of the city! I felt like I was dreaming. Break Sokos Hotel Levi has an on-site coffee house, a huge plus for coffee lovers like me. I really liked the vibe of this cozy place and went there every day. They had a bunch of tempting pastries to choose from (and a good variety of gluten free as well!). It was a good chill out spot to take a break from the frigid outside temps. They also had a bunch of board games to play with which I thought was a fun idea. They also had an onsite restaurant called Kiisa, which serves traditional Finnish dishes, however I didn’t have time to eat here (and also because it was a bit more pricy than other restaurants in the area). But hey, most hotel restaurants are. There was a fitness center right next to the hotel, which offered free access to hotel guests. It was a small but nice gym which I definitely utilized during my time there! There was also a day spa which I didn’t have time for unfortunately. If you didn’t get a room with a sauna, don’t fret. Break Sokos has a public sauna and jacuzzi complex in the hotel. Overall, I really enjoyed my stay at Break Sokos Hotel. The hotel was immaculately clean, stylish, located in the perfect spot, and had everything you could need for a fun and relaxing time in Levi. The staff was warm and welcoming and offered great recommendations on what so do around the area, all you have to do is ask! Really going to try to make it to Finland soon! Looks like March is a good time to go! Finland was not on my radar at all to see the norther lights….until now!! It so warms my heart to hear that people like my home country. Even though it’s cold, haha. I’m from the South and to me Lapland is magical also. I’ve been to Levi twice and I have to agree with you, it’s an awesome place! OMG i loved Finland. I think many people avoid it because they don’t like the cold. But that would be a big mistake! It’s such a beautiful place! Yessss Lapland is the ultimate winter wonderland fairtyale place!! What an amazing place to stay. I love the idea of your own personal sauna! This looks so pretty! I’m planning NYE in Norway, so can’t wait for fun in snow and cosy indoors 🙂 but Lapland is on my list too! Norway is amazing! It’s my fav place in Scandinavia. Have a blast! okay, first of all, your photo of the northern lights IS AMAZING!!!! WOW. just WOW. Also, Levi looks like the cutest town! I enjoyed my time in Finland and wish I got to explore more of it, now I have to add Levi to my bucket list! Beautiful photos!! This looks so cute and cozy! I am going to Finland this winter so I cannot wait to indulge myself in some saunas as well! This is like my dream. It looks so cute and cozy there. This place looks so cozy, and I love the idea of my own in-room sauna. That would feel so nice after a day on the slopes. And the location is perfect. I’ve always wanted to go to Finland, and this is definitely feeding my wanderlust.